Valentine’s Day is sneaking its cupid wings around the corner and all you see is white and red decorations, teddy bears and heart-shaped chocolates everywhere you look. Few things go together like chocolate and V’Day. What exactly is the connection, you might wonder? Whatever the case may be, chocolate is a pleasure to many, whether you associate it with love or not. TravelGround thought it might be a good time of year to tell you more about where to find some of the most decadent and delicious chocolates around the country. There’s always time for some flavoursome chocolates, Valentine’s Day or not! Being one of the tastings at the beloved Spice Route, De Villiers Chocolate is highly unlikely to disappoint. What started only as a hobby in Pieter de Villiers’s garage with machines made out of recycled materials from home, he discovered the wonder and deliciousness of single-origin chocolate. Experimenting with handcrafted chocolate, it also sparked the interest in making coffee and homemade ice cream. De Villiers did some research and found that, even though most of the world’s cocoa beans come from Africa, very few of these beans are turned into chocolate on its home continent by Africans themselves. De Villiers Chocolate is therefore proudly using cocoa beans from the Bundibugyo district of Uganda. At Spice Route you can get your favourite group of chocolate fanatics to come and enjoy this sweet festivities. For ten or more guests, a reservation is required for a tasting, while nine or less people don’t require a reservation. *Single-origin chocolate tasting: R35 per person. This includes a tutored tasting of all five single-origin organic 70% cacao dark chocolate. A booking is required. Tastings end at 16:30. Chocolate and confectionery tasting: R30 per person. This more informal tasting includes various dark, milk and blonde chocolates and some confectionery, and you can do it at your own pace. Tastings end at 16:45. Visit their website for more information of what De Villiers Chocolate at Spice Route has to offer. *Single-origin means that the chocolate is made using cacao beans from one specific place or origin. 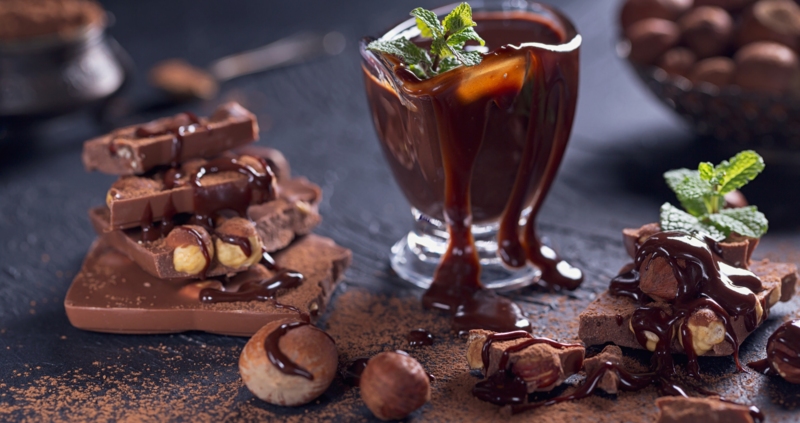 If you’re a big fan of De Villiers Chocolate, make sure to check out the De Villiers Chocolate Café as well, where you can relish in their chocolate, coffee and ice cream! Tastings of all their products are offered here. They boast products that are GMO-free, gluten-free, and free from any artificial colourants, flavourings or stabilisers. Single-Origin: all those dark chocolate lovers out there ─ they’ve got you sorted. African Collection: mostly dark flavoured chocolates that are all made from Ugandan beans. Treats Collection: flavoured milk chocolates, so if you like extra sweet chocolate, this one’s for you. You can make it a solo outing or invite a group of up to four people to enjoy this luxury with you. No bookings are required. De Villiers Chocolate Café boasts a variety of products! Click here to learn more. Belgian chocolate made with a South African twist. Chocoloza was founded by Vicki Bain, a pastry chef working as a chocolatier in Belgium for 14 years. At Chocoloza, only the best fruits and nuts from our country are combined with chocolate made the Belgian way in order to form one mouth-watering treat ─ the best of both worlds. What makes this company special, is that the workshop is part of the shop, so you can pop in and see how the chocolate is made, or you can join in creating chocolate yourself! Chocoloza focuses on using locally-sourced ingredients where they can, mainly organic products and no preservatives. For instance, they get their macadamias from KwaZulu-Natal‘s coast and their raspberries from a farm outside Johannesburg ─ all the more reason to come have a taste! Salty Tango: Salted caramel with crunchy macadamia. Lime and Basil: Fresh lime zest and organic basil ─ a true taste explosion. Whisky: A rich ganache with Glenivet Whisky for that extra kick. Madagascar: A ganache with single-origin Madagascan chocolate and fresh cream. These aren’t the only delicious flavours Chocolaza has to bring to the table. Visit their website to see what you’d like. Chocoloza regularly hosts chocolate evenings where guests get blindfolded while tasting chocolate. So, if you and your friends are up for some sweet competition, you know where to go! This is the perfect opportunity to improve your chocolate taste-buds while on a fun night out, and you can even make your own chocolates. Get in touch and make a booking with Chocoloza if you’re keen to take part in their evening workshops where you’ll learn all you need to know about making chocolate. Opening Times: Monday to Saturday: 09:00 ─ 17:00, Sundays and public holidays: 09:00 ─ 16:00. Where? Factory: 20 San Lucia Road, Greyton / Shop: Oak & Vigne Café, Ds Botha Road, Greyton. Richard von Geusau’s passion is to make not just good chocolate, but great chocolate. Sounds like your kind of chocolate, right? His chocolates are exceptional in that it has high cocoa content, no artificial flavours or vegetable fats, and each one is handmade with only the best ingredients. Von Geusau’s chocolate is well-known in South Africa for its spicy and aromatic ingredients. For obvious reasons, Von Geusau chocolate has been purchased by some of the country’s finest hotels and wine estates. Their Slab Range includes decadent milk chocolate slabs, white chocolate slabs and dark chocolate slabs with exquisite flavours such as lemon and vanilla, almond and orange peel, café latte, mint, cherry and salted caramel. Other slabs include tonka bean slabs, sugar-free chocolate slabs and Meerkat chocolate slabs ─ the latter being extra special as it celebrates South Africa’s fauna and flora with flavours like milk Rooibos and dark Fynbos. Yum! Marachino Cherry Wedges: Marachino cherries combined with luxurious ingredients. Chocolate Truffles: truffles combined with raspberry, creamy liqueurs, banana coconut and caramel, and some other flavours you’d thought would only happen in your wildest dreams. Chocolate Bouche: a chocolate log (yes please!) combined with the finest liqueurs. Von Geusau chocolates also craft specific chocolates that can be specially branded or co-branded according to their clients’ specific needs. They even boast seasonal chocolates such as their Easter Selection (hand crafted Easter eggs and bunnies) and Winter Warmers (a chocolate-dipped stick that makes a mouth-watering beverage when you add hot milk). Click here to read all about the deliciousness of Von Geusau Chocolates. It’s safe to say that the best chocolate isn’t to be found in Switzerland or Belgium only. You don’t need to travel far to find a chocolate in South Africa that will make your chocoholic heart melt. There is a flavour ─ and a chocolate ─ for everyone in our beautiful country. Who said Valentine’s Day is only for the love birds? Spoil your mom, dad, sibling, friend (or significant other, if you insist) to a chocolatier near you, and make this coming Valentine’s Day one for the books!